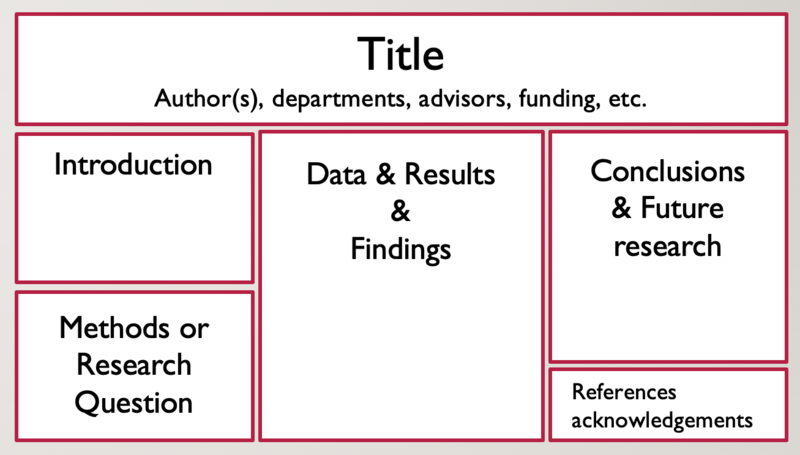 Learn the basics for creating a research poster and preparing to present your research. Posters are typically laid out in "landscape" (48" wide x 36 " high), but may be done in "portrait" (36" wide x 48" high). Decide this before you start designing your poster. Make the flow of the poster obvious to the reader. Often there are 3-4 columns across with 1-3 blocks of text and image in each column, but there is no one right way. Find your central point and consider the text, charts, or images needed. A good poster will convey the essence of your paper without your explanation and also serve as visual aid to support your verbal explanation. The title of your poster may be slightly different from your paper's title. Choose a title that will attract viewers and convey your central point. Use 100+ point font for the title and keep it to 1-2 lines. Use slightly smaller font for your name and affiliation. Follow the organization of your paper to plan the layout of your poster. The sections of your paper can be translated to blocks on your poster. Aim for a total of 300-500 words on your poster. Do not paste large blocks of text; explain with visuals as needed. Research posters are a visual representation of your paper or project. They typically include both small blocks of text and images (photos, charts, graphs, etc.). A poster will quickly educate the viewers it attracts about your work, as well as serve as a visual aid when you present your work to your viewers ("As you see in this graph... "). 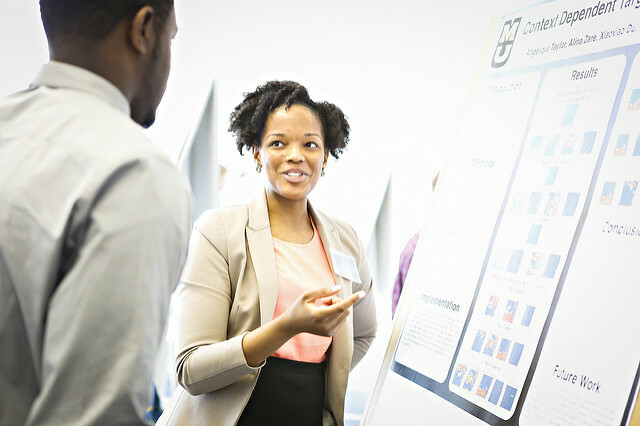 Creating and presenting a poster allow you to showcase how your research fits within your discipline and the scholarly conversation happening with your topic. Not only do you get to present your work, but also discuss the ways you are adding to, critiquing, responding to, or filling a gap in your field of study. A poster can be a great starting spot where you can check in with other people, get feedback on your work, and begin to think of your next steps (publishing an article, presenting at a conference, or more!). PowerPoint is often the go-to program for research poster design. It is familiar to most people and many templates are available online. Penn State students can freely download Microsoft Office programs including PowerPoint. InDesign is a high-powered layout tool from Adobe available for free to all Penn State students through Creative Cloud. This program has a learning curve, but you can access free lessons from Lynda.com. InDesign gives you complete control over all aspects of design and formatting of your poster and can help you creat a high-quality poster with crisp graphics. Activate your license and download the program. A web-based layout program with free and paid options. Quick to use and learn, but some elements are limited to paid accounts and may not be standard to other programs, like font sizes and styles.